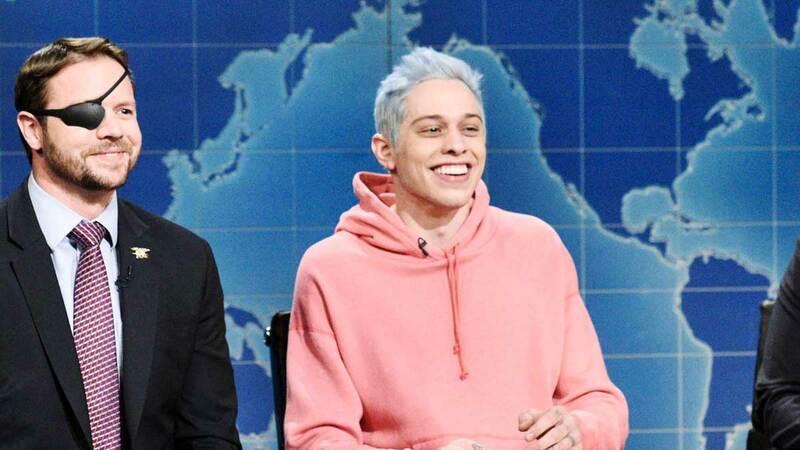 Last weekend when Pete Davidson made a very mature and heartfelt statement about his breakup with Ariana Grande on Saturday Night Live, it seemed like he was done making jokes about his ex-fiancée. (As a reminder, he said: "I know some of you are curious about the breakup, but the truth is it's nobody's business and sometimes things just don't work out. And that's okay.") That was also the night that Ariana released "Thank U, Next," so it felt like the couple was ready to move on from any/all drama. Well, I'm here to tell you that no, Pete is not done publicly talking about his ex. Last night on SNL Pete continued to reference/poke fun at his time with Ariana. First, Pete joked about his living arrangement again, which he's been doing since he presumably moved out of the apartment that he and Ariana shared. At one point during the show, he joked, "Can you imagine being Pete Davidson's mom? It can't be easy when everyone's mad at your son and roommate." He also more directly referenced Ari when Congressman-elect Dan Crenshaw made an appearance on Weekend Update. Dan's phone started ringing with the ringtone set to Ariana's song "Breathin." Pete asked if Dan is going to pick it up, and when Dan said that it would be too rude to answer the phone on air, Pete says, "No, it's cool. Ariana Grade's cool, man." And Dan then trolls Pete by asking, "Oh, do you know her?" Not to be cliche buttttt thank you Pete, and please, next.